Melbourne street artists became both subcultural heroes and public enemies – depending on who you asked. Despite the howls of protests from some, Melbourne’s street art came to be one of the city’s key cultural calling cards, duly named by Lonely Planet as among its top tourist attractions. Then and Now, a new show opening on Friday in a derelict Collingwood warehouse space, showcases the work of three of Melbourne’s early street art pioneers – Haha, Dlux and Sync – but also reveals where these artists have arrived at in 2014. 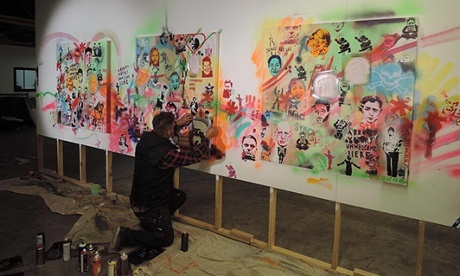 The show is divided into two large spaces – the “then” part of the show containing old-style stencil art, and the “now” section displaying more complex recent works. The three artists have collaborated on several large murals in which the canvasses are bursting with juxtaposed stencils of familiar pop culture faces making political statements such as “Abbott voters unwelcome here” and “Bomb me”. These, along with a series of somewhat malevolent faces on old street signs, appear almost retro and staid in this context. The most interesting work comes from the artists’ newer creations. 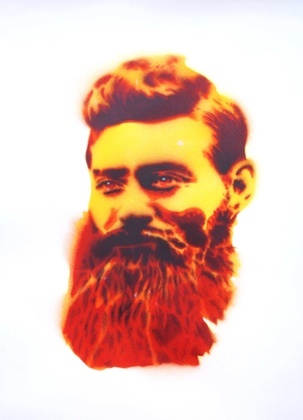 One of Haha’s central motifs is Ned Kelly, and his Ned’s Head triptych is now part of the National Gallery collection. Some of Haha’s Kelly stencils are displayed here,displaying his mastery of the stencilling technique as well as the cultural allusion to the artist as outlaw. Daliesque motifs: a new work by Sync. Sync’s new work sees him moving into a modernist, surrealist direction while still retaining a street art aesthetic. 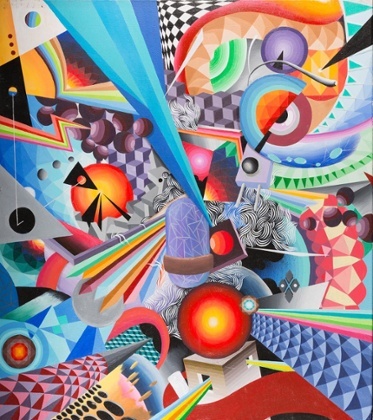 His work delivers an energy-packed, kaleidoscopic wonderland where street art and Daliesque motifs coexist. Dlux’s recent works attempt to capture the “scrawls” of tagging in both surburban and rural settings, incorporating them into often naturalistic landscape work. 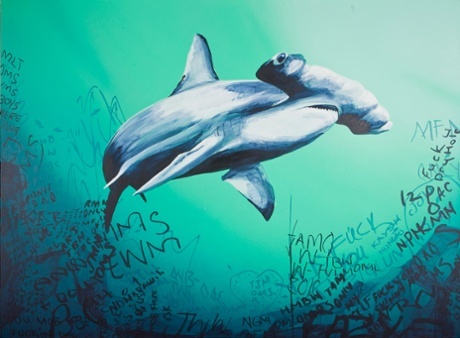 In one standout piece, a hammerhead shark swims into the deep blue with the darkness of the ocean illustrated by graffiti scrawls the artist collected up in Arnhem Land, where the shark is a totem animal.